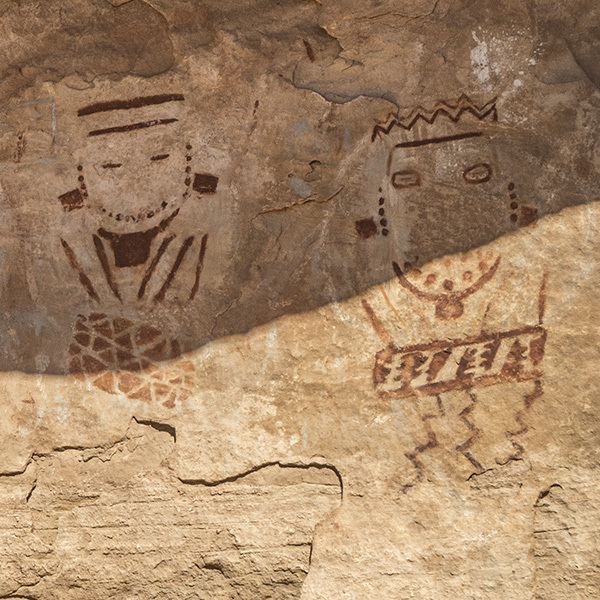 From granaries and grinding stones to petroglyphs and cliff dwellings, Salt Creek is teeming with Ancestral Puebloan culture. Starting high on a pinon and juniper-studded mesa, the trail drops 1,000 feet in two miles to the canyon floor. You officially cross into Canyonlands National Park where a wooden sign marks the boundary. Domes of Navajo Sandstone rise along each side of the drainage, and the trail cuts through overgrown brushlands. A spring fills several potholes around 3 miles. This may be the only reliable water source for the next 17 miles (depending on the season), so load up here. Not far past the spring, you reach the rickety remains of Kirk’s Cabin. Lee Kirk was a homesteader who built the wooden cabin in the 1890s. Feel free to poke around — tin cans, horse shoes, and other historic artifacts from the homestead have been gathered inside. As you continue downcanyon, look for a spur trail veering off to the right (east) to reach campsites 1 and 2. Navigating along Salt Creek proves simple but the walking tedious. You pass campsite 3 around 7 miles, after which the trail cuts through a break in a sandstone fin. The canyon, which has been relatively open and broad thus far, narrows significantly. Progress slows as you weave along the creekbed and over benches, and you reach campsite 4 around 11.5 miles. A half mile downcanyon, look for the spur trail to Angel Arch on the right. The detour adds 3.4 miles to your trip total (not included in mileage listed above). To get there, follow the now-closed 4-wheel-drive road southeast for about 1.7 miles. Return the way you came. You’re now in the at-large camping zone, with several spots to pitch your tent in the main canyon near the spur to Angel Arch. Past this, the canyon constricts further. You pass a sculpted slickrock section of the canyon that may hold some water, but don’t count on it. Proceed downcanyon, weaving in and out of the meanders. In another 8.5 miles, you reach Peekaboo Spring. The trail climbs up through a hole in the rock fin, dumping you on the opposite side and saving you from walking around the bend. From here on out, you’re in day hiking territory, so expect to share the trails with others. As the trail turns west, it climbs out of the floor of Salt Creek Canyon and traverses across stunning slickrock benches. The park service has put in several steel ladders to help ease the difficulty of steep sections. Around 22 miles, you drop to the floor of Lost Canyon and reach a trail junction. Continue west, crossing Lost Canyon and climbing up to a ridge separating it from the next drainag. The trail descends from the saddle into Squaw Canyon. Stay straight at the junction, and finish out the mile walk back to the Squaw Flat Campground parking lot. Cathedral Butte Trailhead: Take Highway 191 south out of Moab. At about 40 miles, turn west (right) onto UT 211. Continue for 20 miles, past Newspaper Rock, and turn left on Beef Basin Road. It’s a long, bumpy 17 miles on this dirt road to reach the Cathedral Butte Trailhead (high clearance recommended). Squaw Flat Trailhead: Instead of turning left onto Beef Basin Road, continue on UT 211 to the park visitor center. Follow signs to the Squaw Flat Campground road and turn left. Pass the road on the right that goes to a second group of campsites. Arrive at a parking lot on the left with a pit toilet and split rail fence. The beginning of the Salt Creek Trail lies outside of Canyonlands National Park. But President Obama's declaration of Bears Ears National Monument gave the upper Salt Creek Canyon and nearby Beef Basin added protections. Keep tabs on monument lands that were stripped of protection. We'll send you emails with opportunities to weigh in on proposed plans and projects that affect Bears Ears and other public lands across the plateau. Love what Bears Ears Stands for? By giving to the Trust, you're helping win back protections for the monument, supporting on-the-ground work, and advocating for the protection of public lands.